Flock of chaffinches and bramblings at roosting, subjects are well placed on both right and left sides; there are birds both in flight and still on the tree branches. Between 1.20 and 1.25 seconds, you can feel the fledging of a pheasant from left to right sides. This recording clearly brings out the stereo effect that we can get with the HiSound Stereo parabolic microphone system, built with 2+2 Primo EM172 capsules PZM placed no longer directed against the disc separator (baffle), but on the same plane with the baffle itself. 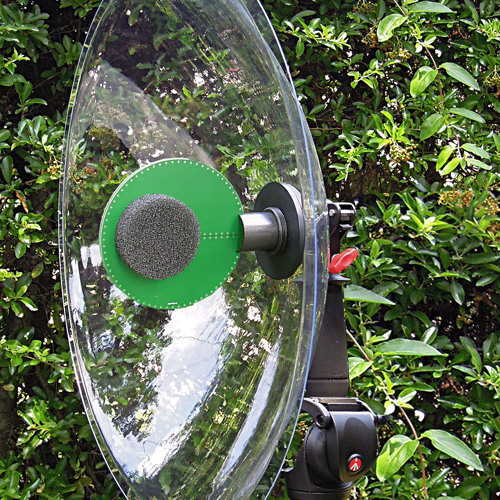 This allows to have a high frequency response higher than the traditional PZM system, as the capsule directed against the baffle constitutes an obstacle to the passage of small sound wave.